Celebrate your values with professional flyer templates. Find diverse, amazing styles to fit your events. Hosting a new church event this Sunday? Style the promotions to your liking with a professional flyer template. We’re making the process a whole lot easier with this list of premium templates from Envato Market and Envato Elements. 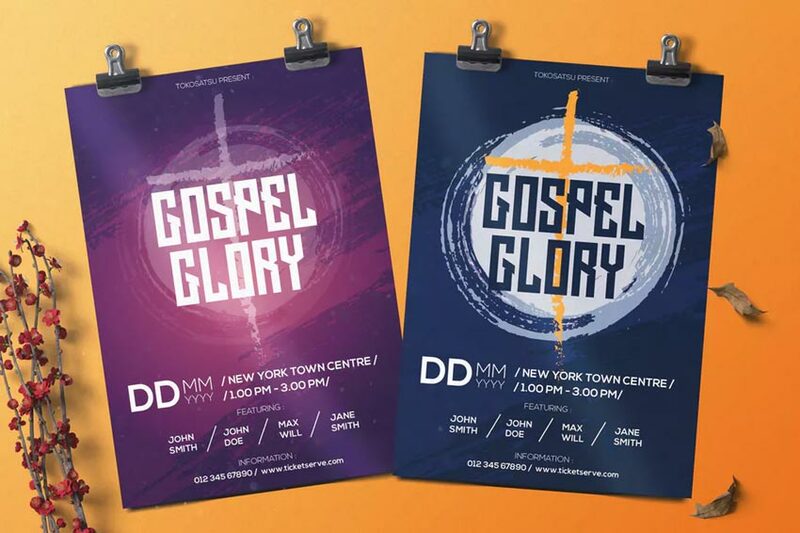 Check out this amazing collection of 31 flyers inspired by creative church events and celebrations. Launch your event with beautiful, scenic imagery. Our first Photoshop church template includes an incredible landscape background along with elegant serif fonts. It’s best suited for Photoshop versions CS6 and above, so just drop your info in to get started. This next template includes editable fonts and colors. 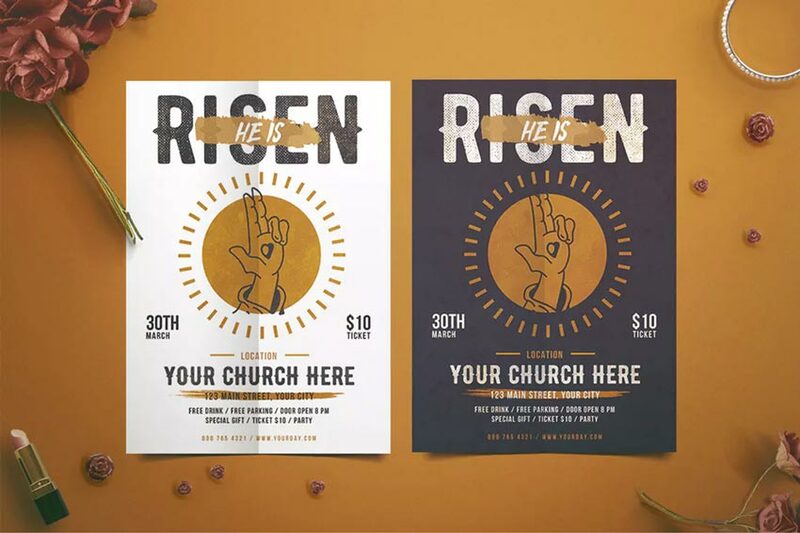 This modern take on a traditional church event uses vector-inspired artwork as the backdrop. Add your details to the title and subtitle info in a matter of minutes. Get this print-ready design for Adobe Photoshop. Share your talents with the world! This Photoshop flyer features a fantastic golden color scheme with stunning bokeh lights and more. Highlight your star guests with three rectangular panels and room for event details. Take your event to the next level! Sing your heart out! 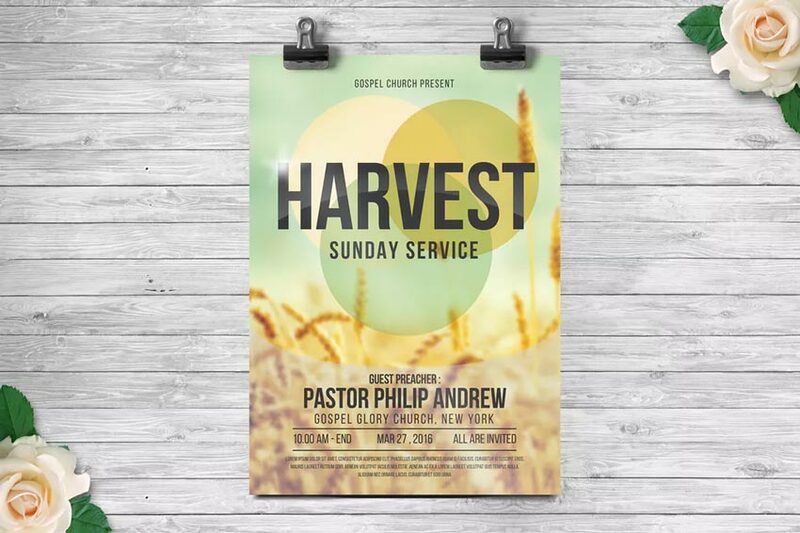 Invite locals to an upcoming service with this church fall festival flyer template. This simple template pairs well with landscape and macro photography. Utilize the editable placeholders to customize this flyer fast. Add it to your collection! Are you ready for Easter? Get everything in order with this Easter Day flyer. 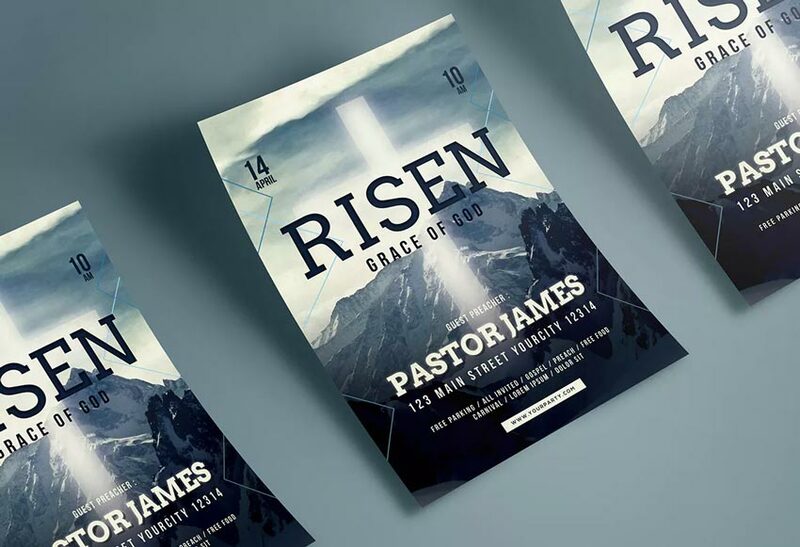 This church event flyer template includes light and dark versions along with a neutral color palette. This download includes both Photoshop and Illustrator files that are compatible with CS5 and up. 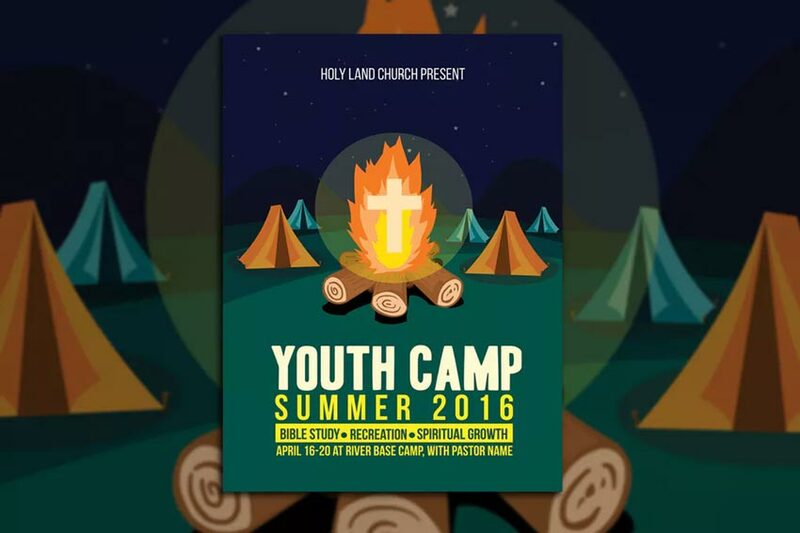 Prep for the upcoming summer season with a fantastic youth camp church flyer like this one. Well-organized with editable fonts and text, this flyer template is smart and easy to use. Update it with your style favorites for a brand new look! 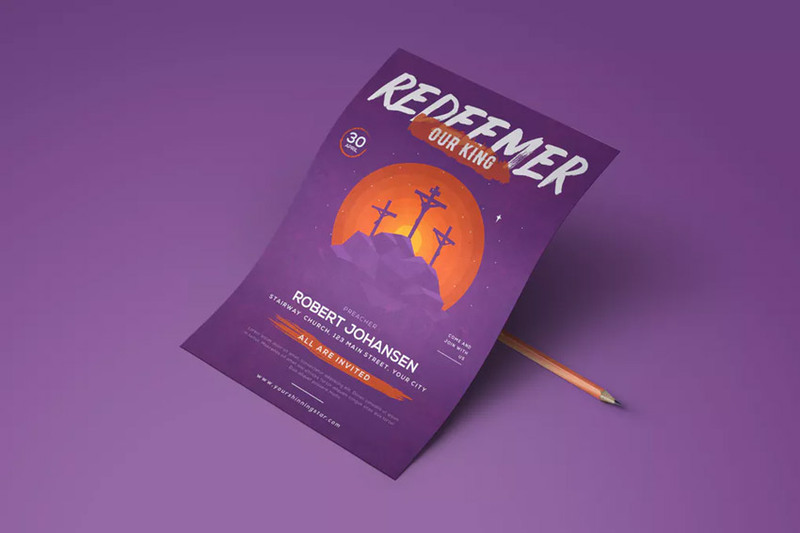 Looking for a modern church flyer? 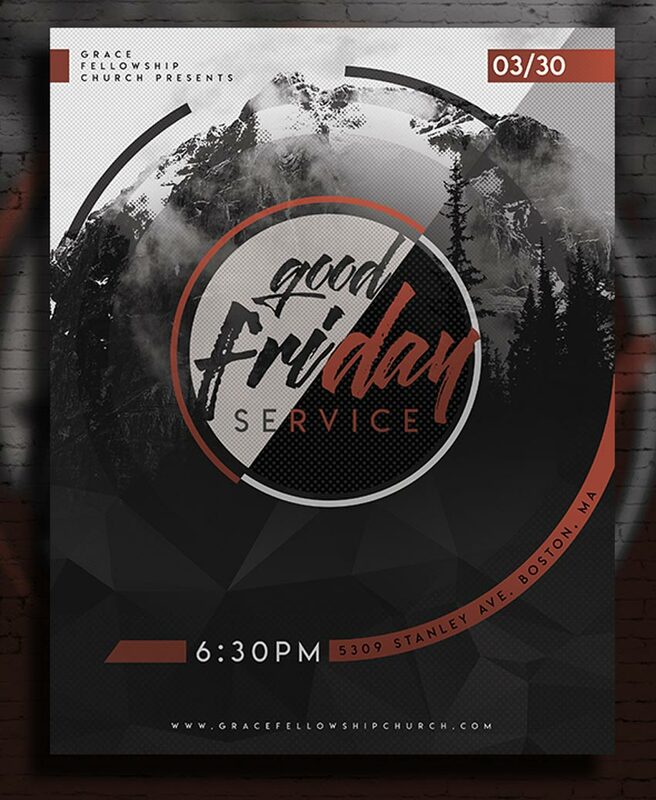 This next Easter Day concept makes for a clean and simple flyer. Enjoy simple vector illustrations along with bold sans-serif fonts. Just plug your items, service details and more into these editable Photoshop templates today. How will you celebrate Christmas? 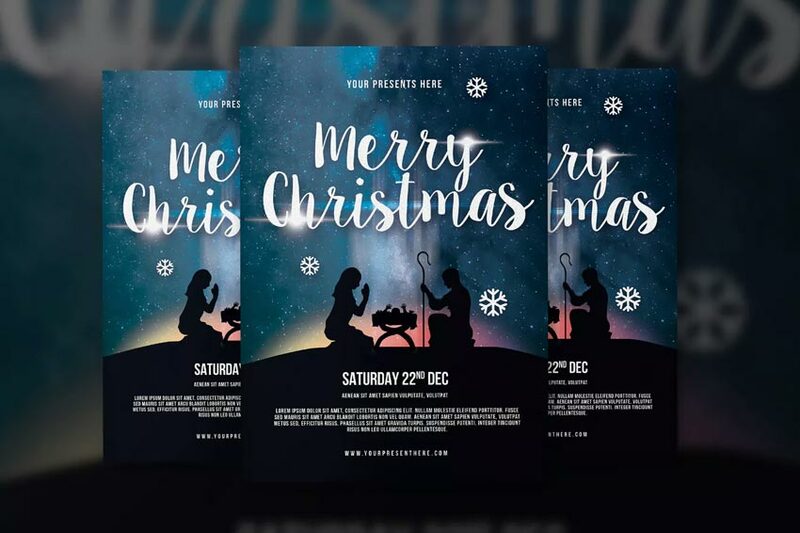 Kick things off with this Christmas church flyer template. 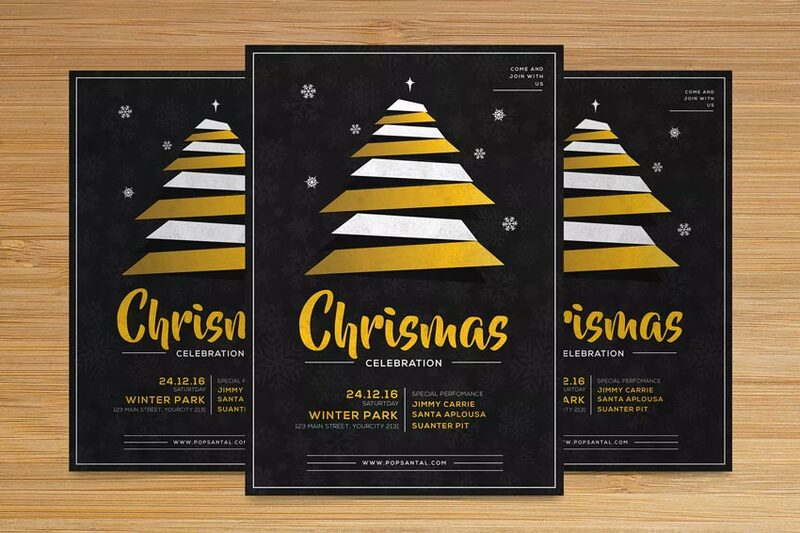 This template features a fantastic black and white color scheme with bold gold accents. Enjoy the modern Christmas tree design along with high-quality files. 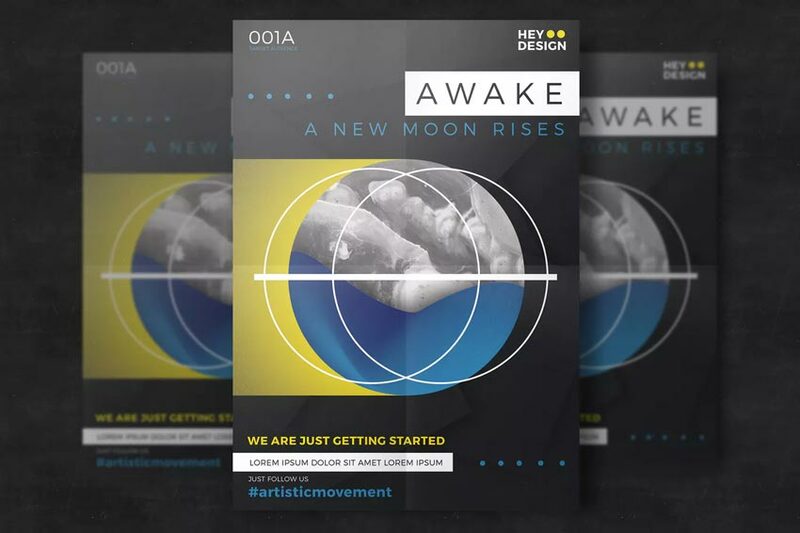 Explore your awakening with this creative minimal flyer template. 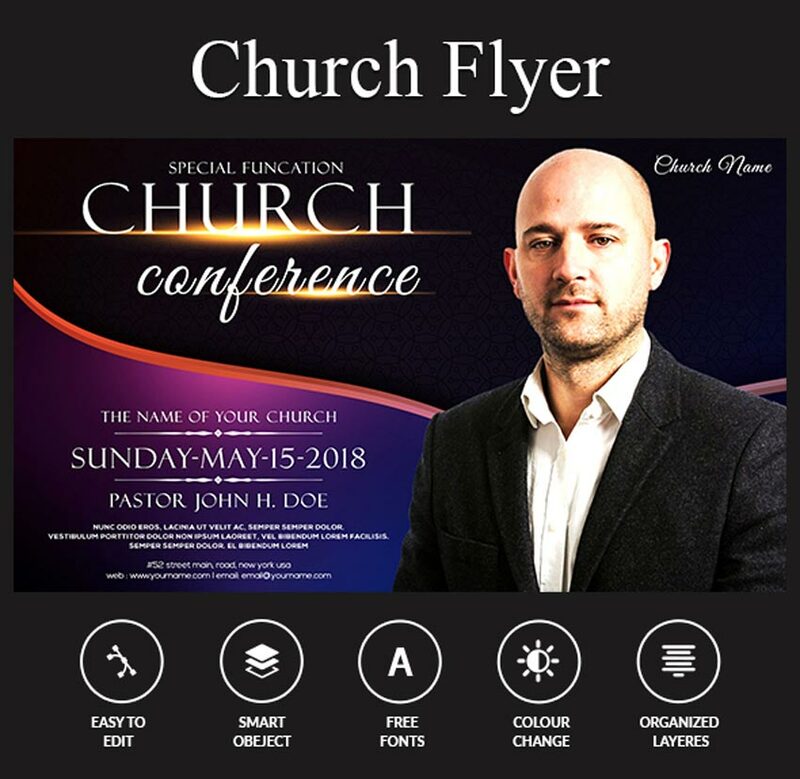 The background is chic and conceptual, and this template also offers you many customization options for church events and conferences. Promote your event with style! Merry Christmas! Bring all your loved ones together with this stunning night-time design. This concept can be used as a quick raffle template or for more special events. Get a clean and structured file to try out with the latest versions of Adobe Photoshop. 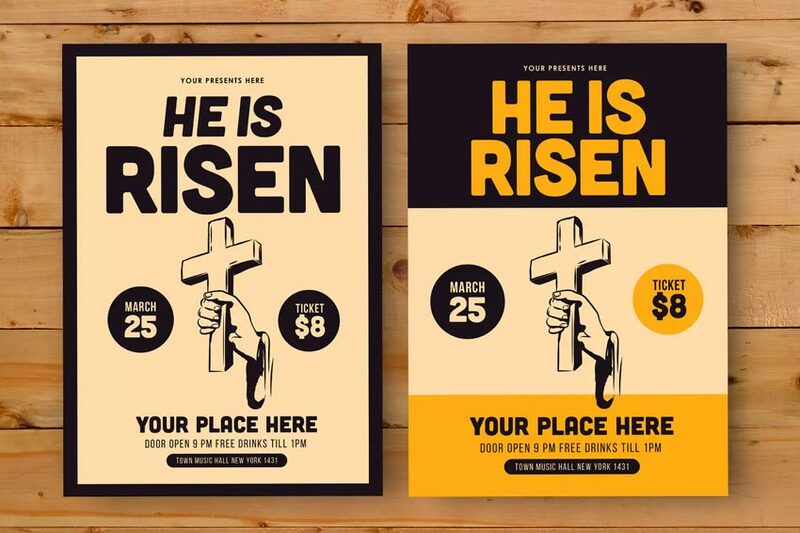 Still looking for the perfect Easter flyer? Then take a look at this delightful and cheery design. 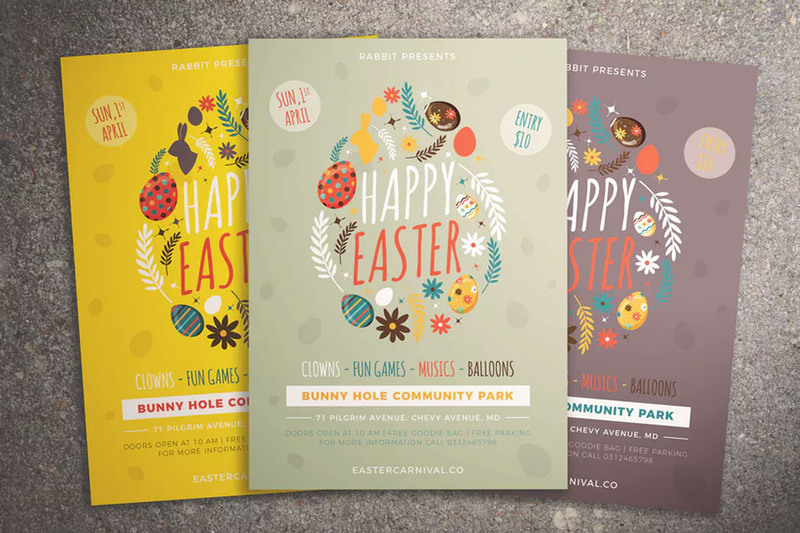 This colorful flyer features simple vector elements like Easter eggs and flowers for a pretty and effective arrangement. Use it for any Easter events, festivals, and more! 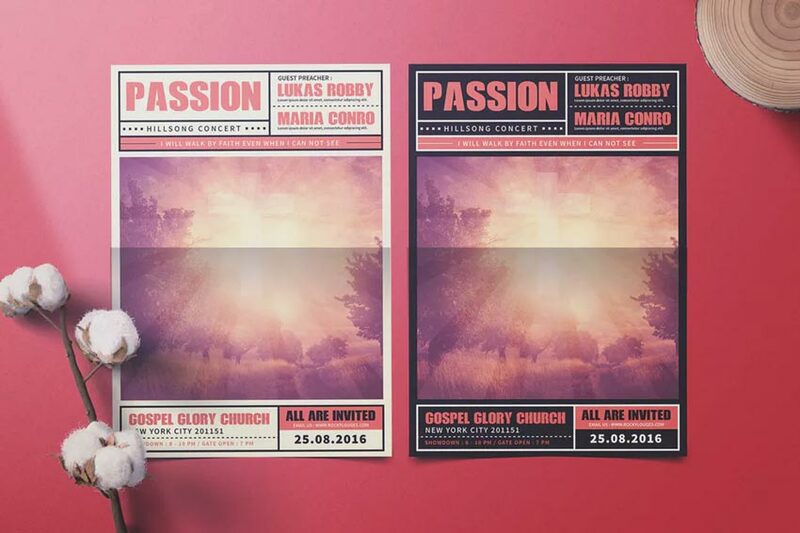 Show off your passion for gospel music with this next church flyer template. Made especially for gospel concerts, this flyer template can be customized to your needs in a matter of minutes. Save valuable time and money with a reliable monthly subscription. Want a fundraiser flyer template for your special events? 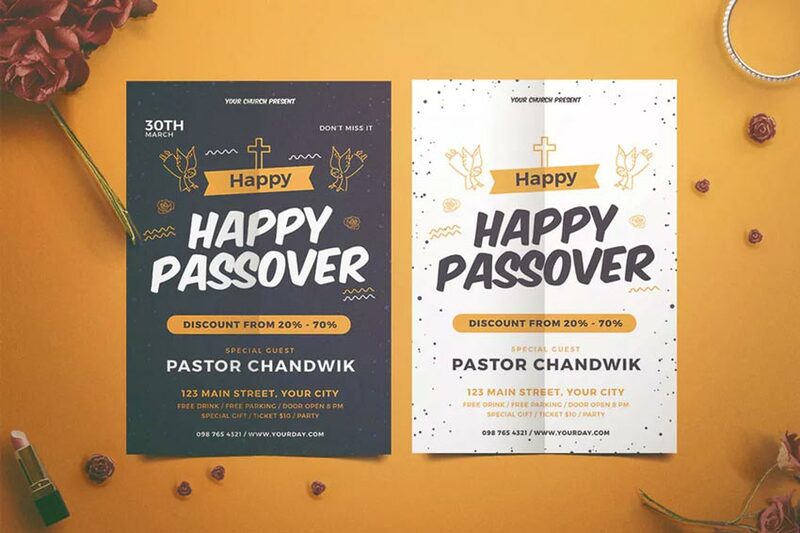 Then take advantage of this wonderful Passover flyer from designer tokosatsu. Enjoy both Adobe Illustrator and Photoshop files for an effective and efficient flyer. Check it out! Happy Passover! Just about any design can be turned into a church bake sale flyer template. We know you’ll like this next flyer template featuring light and dark versions and adjustable text. This fully layered vector file works best with Illustrator and Photoshop versions CS5 and above. Ready to sing? 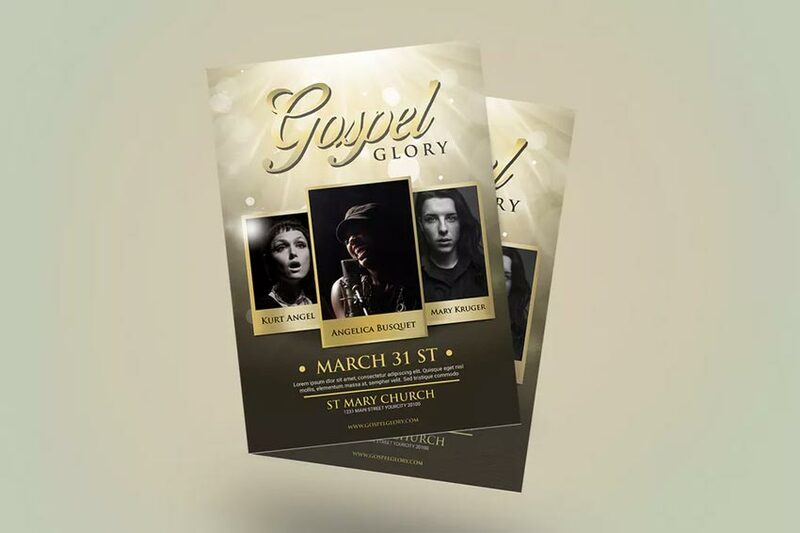 Let your work shine with a great gospel music flyer. This template is simple but effective. It features bold, modern color schemes along with fantastic textures and more. Insert your event details and location into the easily editable text placeholders. 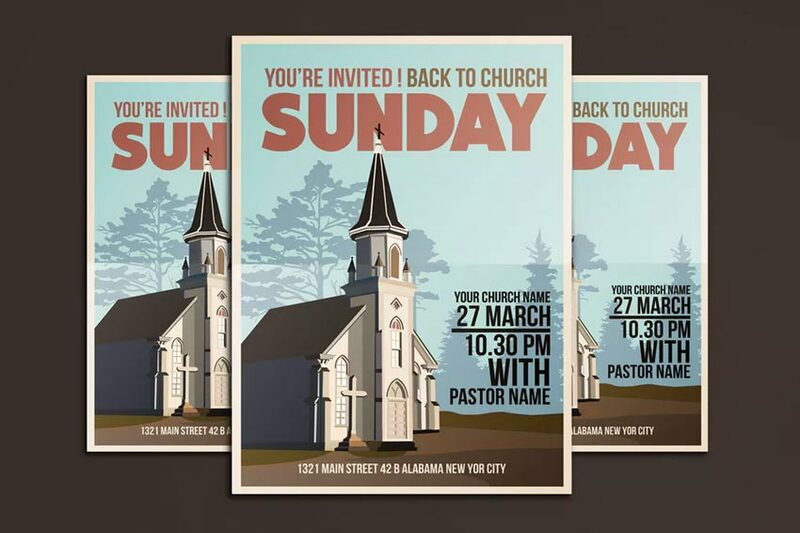 Create a wondrous design with this next template for church flyers. 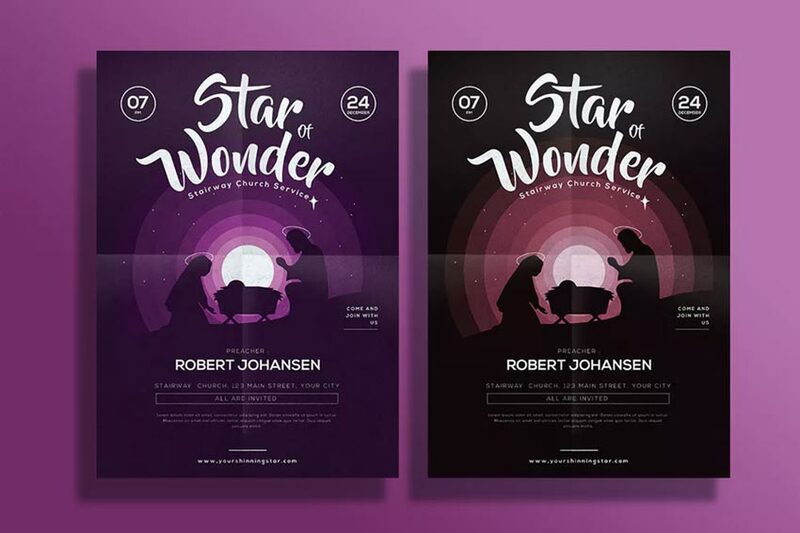 Inspired by the famous nativity scene, this flyer includes standard print sizes that are ready to go. Stay organized by planning for your upcoming events with this church template. Let’s start with this striking church template. This elegant flyer was made in Adobe Photoshop and comes in four vibrant color schemes. Pick from yellow, green, orange, and red versions or stylize it yourself. Also included are links to free fonts. 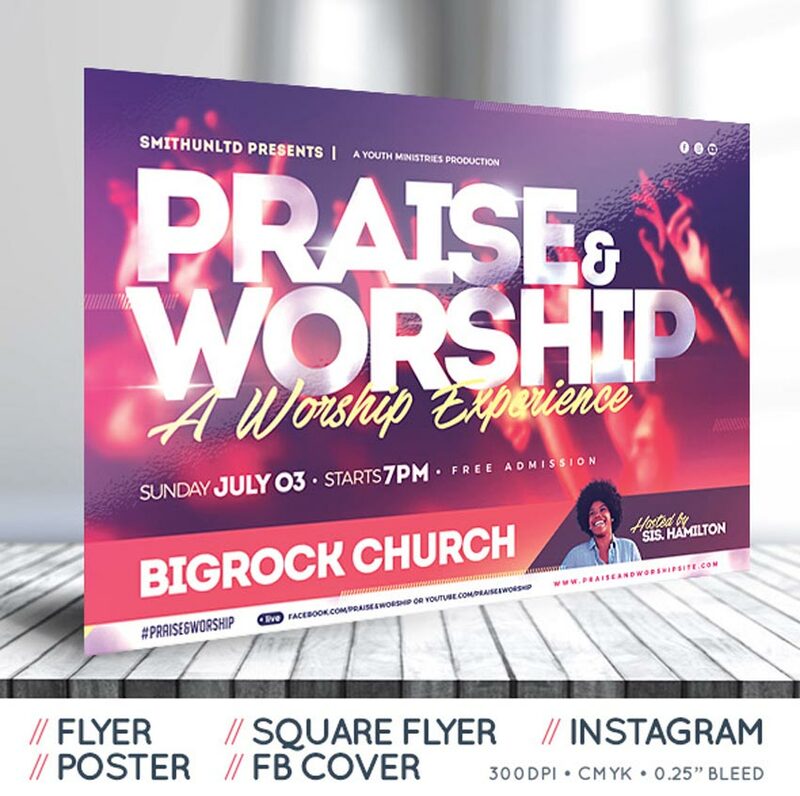 Praise and worship with this next stunning flyer. 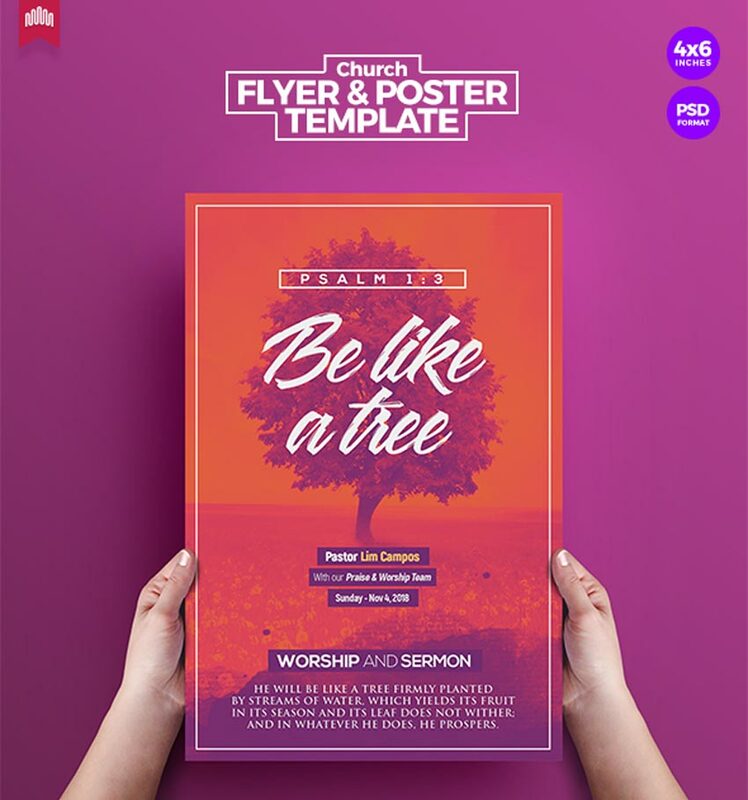 This modern church template is creative and great for local promotions. This complete set of marketing materials also includes extra awesome benefits like social media covers and more. Add it to your collection today! Feel an awakening? Highlight your special guests with this minimalist flyer template for a church family and friends day. 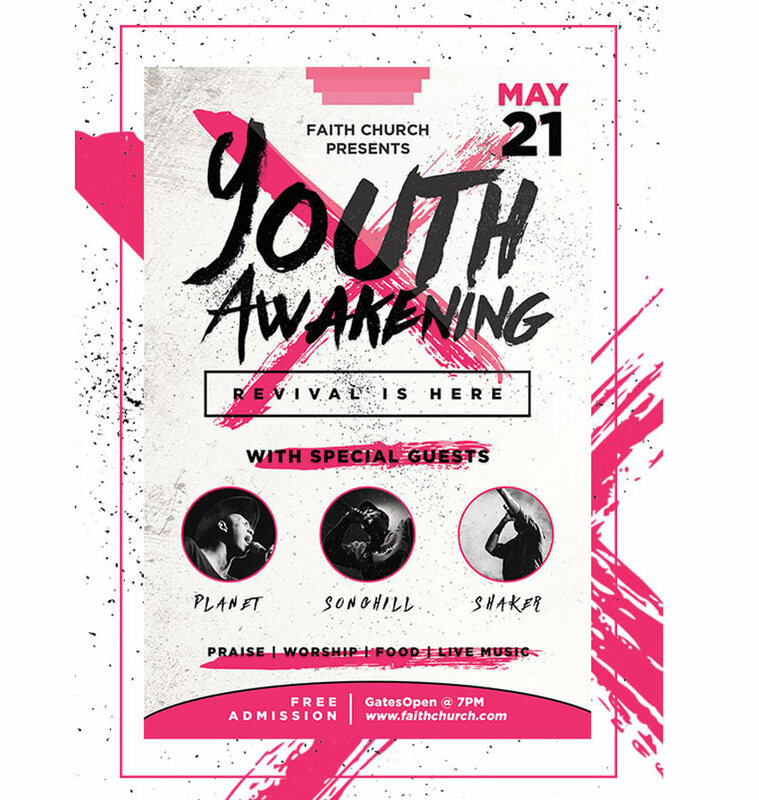 Best suited for concerts and festivals, this flyer includes a simple aesthetic with striking pink details. Enjoy grunge fonts and more! 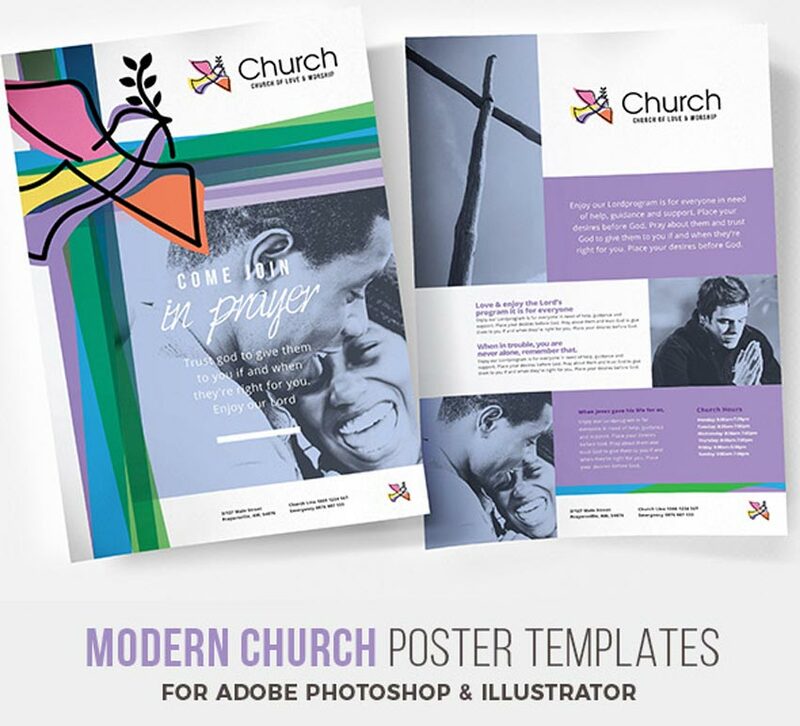 Create an uplifting experience with this modern church template. This download includes both Photoshop and Illustrator files for more flexibility. Enjoy versatile, high-quality templates to outline your church services and events. Check it out! Is it Good Friday? Remind your neighborhood with this original church flyer template. Created with trendy brush textures, this flyer template can be used for special ceremonies and celebrations. Enjoy an engaging design that is fully customizable. Church templates are easy to edit because of their wonderful smart object layers. And this next conference flyer also includes clean and structured files. Free fonts were used for the design, so you won’t have to pay more than $10 to try this one out! 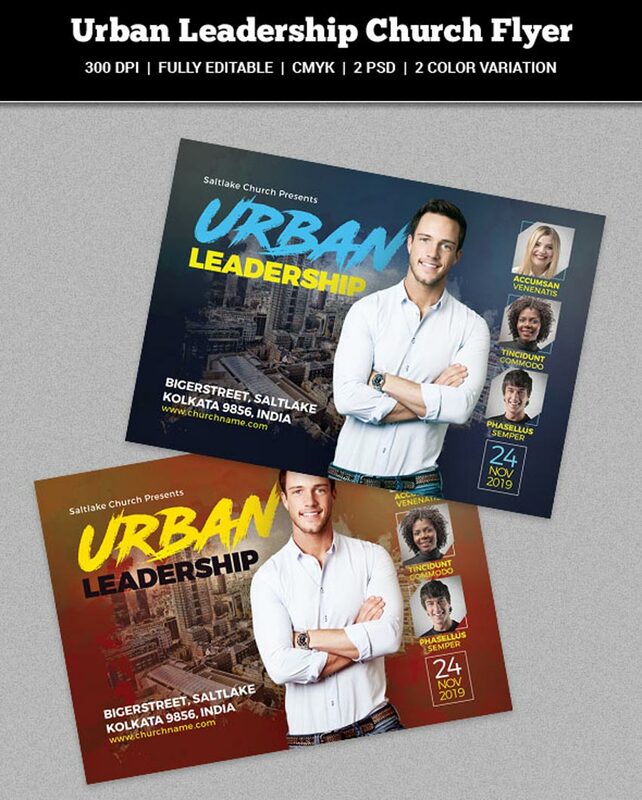 Setting up an urban leadership event? Check out this great flyer template. Get two amazing color versions (blue and orange) to try out. Feel free to switch it up with more details and information with the help of Adobe Photoshop. Add it now! Or put your faith into an exciting church event. This basic flyer template highlights performances by your favorite artists. 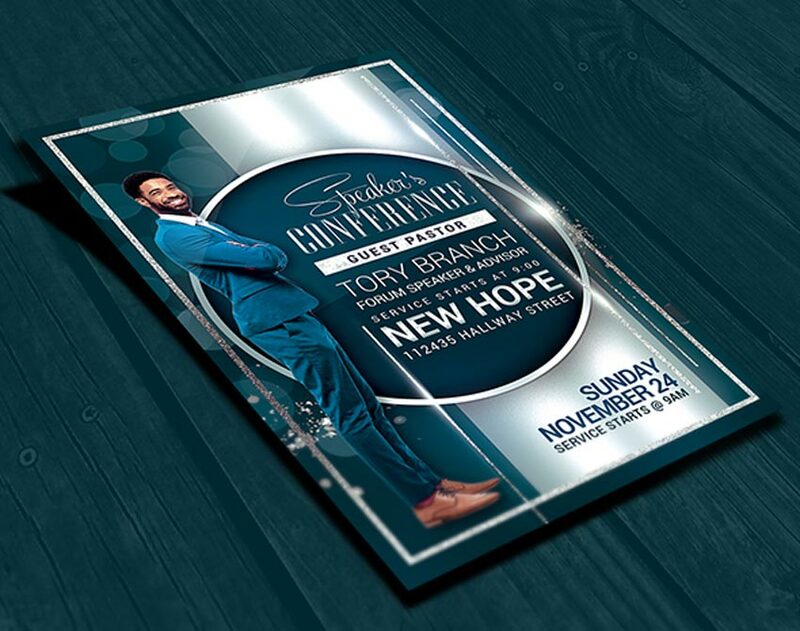 Host the celebration of a lifetime with a beautiful church flyer template like this one. Check it out for more information! 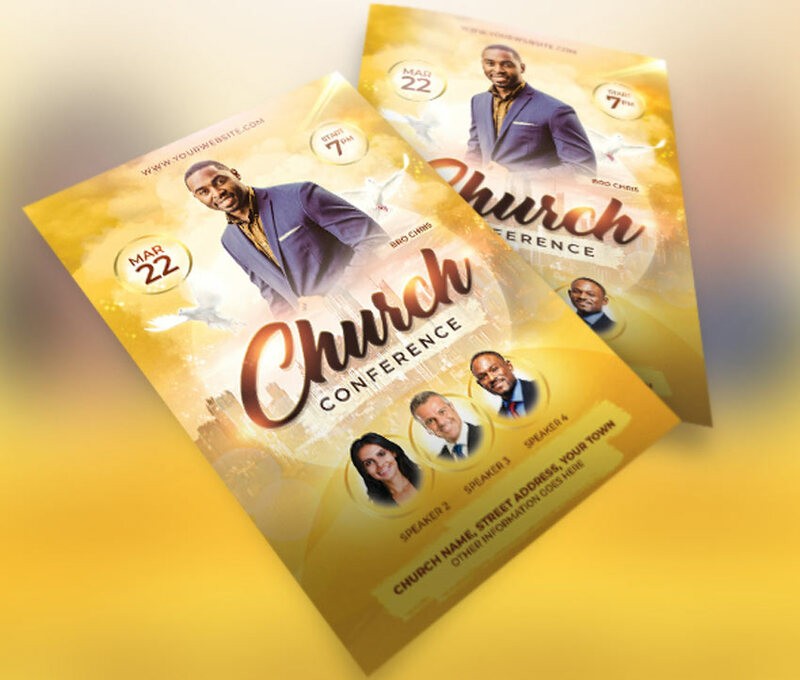 Need a church conference flyer fast? 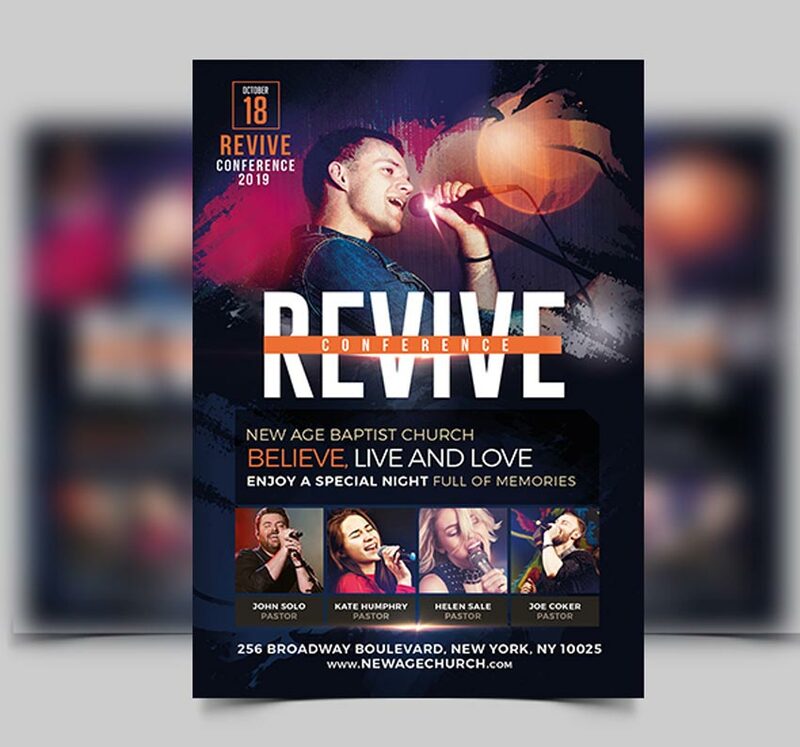 Set your eyes on this stunning revival flyer from designer madridnyc. Center your musical guests behind a bold title that is clean and stylish. Announce upcoming events faster than ever before. Try it out! What is the origin of your faith? 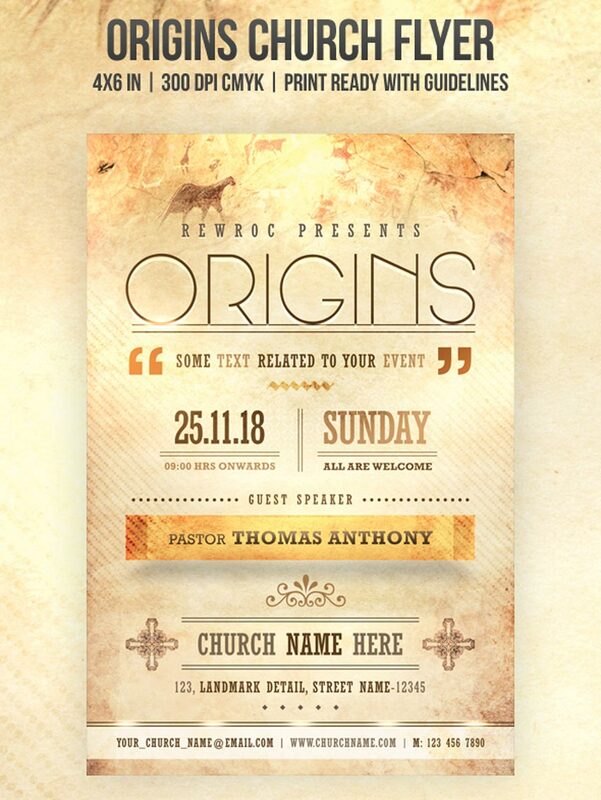 Discover new lessons with this well-made origins church flyer. This template is bright and minimalist. Use it to present your ideas to friends and family or as a phenomenal event flyer. Check it out! Do you go to church events? Churches are now finding it easier to share their message with the world. 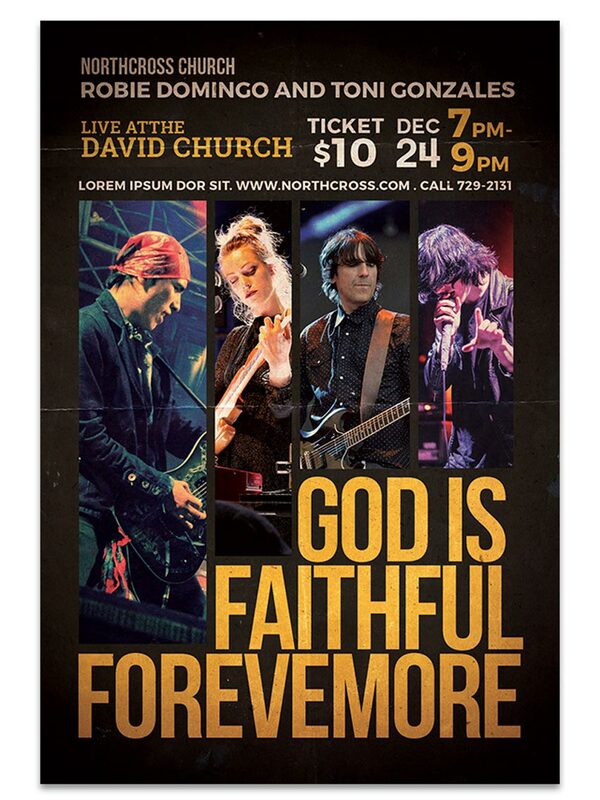 This next church flyer features a vibrant gold color scheme with fully editable text elements. A help file is also included for more instruction. Give it a try! The wonderful thing about these designs is that you can highlight special guests your audience would love to hear from. 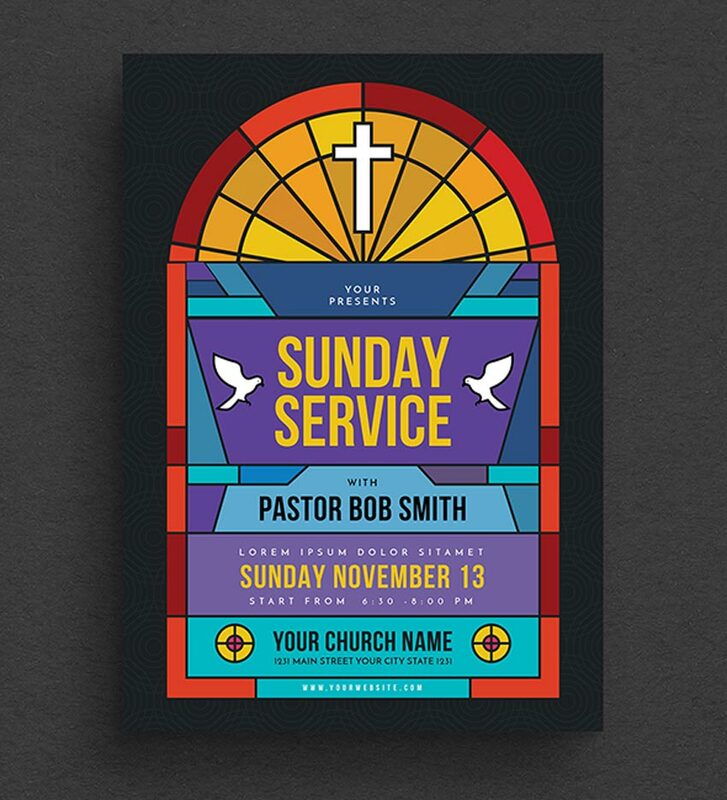 Consider this bold and beautiful church template from designer Jensanity. Get print-ready Photoshop files that are super easy to edit. Going to a conference? 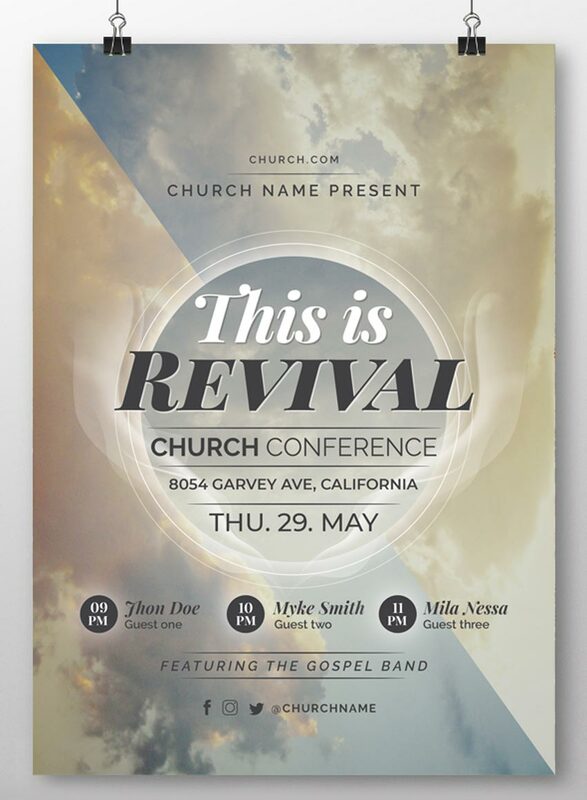 Make the announcement with this ethereal church conference flyer template. This template uses a lovely cloud background that you can update with any portrait or landscape photo. Use it for conference, conventions, or prayer meetings. Are you speaking at the next event? 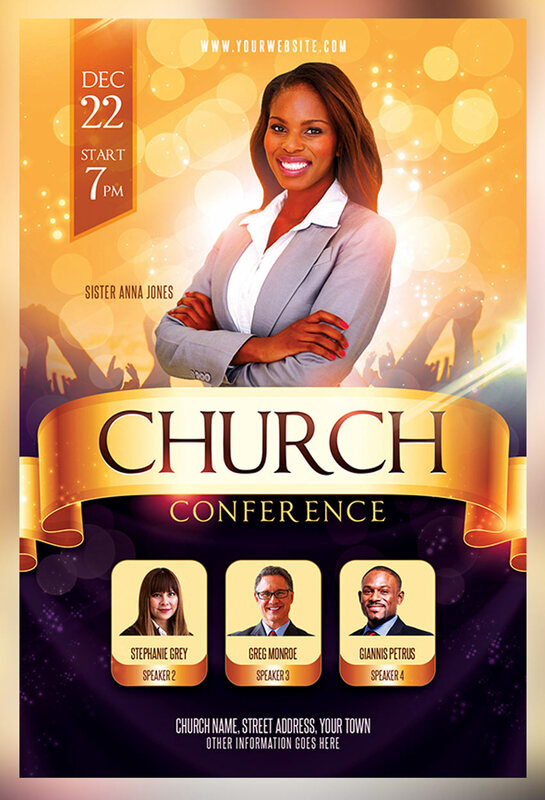 Don’t forget to let your community know with this church conference flyer template. This template is great for pastors and ministers. You can include a full body photo along with details of your upcoming event. Check it out! Need a church bake sale flyer template? This 100% vector file can be edited with Adobe Photoshop or Illustrator. Design a flyer that fits your needs using the well-organized layers and free fonts. Enjoy elegant sans-serif fonts like League Gothic and Josefin.